How to watch Charlie and the Chocolate Factory (2005) on Netflix Singapore! Sorry, Charlie and the Chocolate Factory is not available on Singaporean Netflix, but you can unlock it right now in Singapore and start watching! With a few simple steps you can change your Netflix region to a country like Spain and start watching Spanish Netflix, which includes Charlie and the Chocolate Factory. We'll keep checking Netflix Singapore for Charlie and the Chocolate Factory, and this page will be updated with any changes. 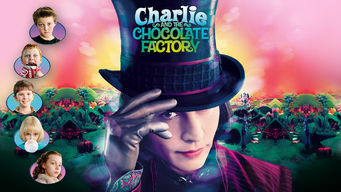 Charlie and the Chocolate Factory is not available in Singapore BUT it can be unlocked and viewed! The eccentric Willy Wonka opens the doors of his candy factory to five lucky kids who learn the secrets behind his amazing confections. One sweet boy wins a tour of the sweetest place on earth. But he'll have to best four brats for the ultimate prize. There is a way to watch Charlie and the Chocolate Factory in Singapore, even though it isn't currently available on Netflix locally. What you need is a system that lets you change your Netflix country. With a few simple steps you can be watching Charlie and the Chocolate Factory and thousands of other titles! Watch "Charlie and the Chocolate Factory"